Many a gardener, working on a newly purchased property in a subdivision of new homes, faces the dilemma of installing plants in full sun. Often, the solution is to plant all full sun plants that can handle the current conditions. But as the new gardener also plants trees and shrubs, a time will come when the garden has substantially less sun and the plants established at the beginning begin to languish in the diminished light. I experienced the situation in which plants in beds were initially in full sun, but as the years passed it became shadier. With that change came the discovery that there are really many plants that solve this problem, and grow in both sun and shade. Alchemilla mollis (ladies mantle). 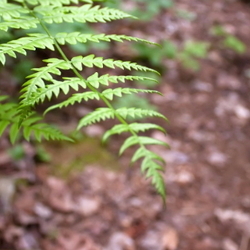 A beautifully, low maintenance classic (and elegant) plant that spreads over time. It can handle full sun with some water but actually gets better with more shade. And it’s a beautiful edging plant. It is easy to divide, and also forms clumps of seedlings that can be moved to other locations. There are several new cultivars that are smaller and have differently shaped leaves (more scalloped) but the old classic is readily available. Fragaria vesca reugen, or woodland strawberry, clumps, rather than running like many strawberries, and is the most amazingly elegant plant. It forms beautiful little leaves with white flowers that turn into the most delicious little berries. Not only is it very easy to divide and move around the bed, but it can easily be grown from seed. I love to use it as an edger. Because it has seeds in the berries it will be spread around your yard by wildlife, and you can simply pick up the little clumps and put them where you like. It's also a beauty in pots. Heuchera sanguinea 'Firefly', which can be grown from seed, persists where many heuchera do not, has bright red flowers and reblooms if the flowers are cut. 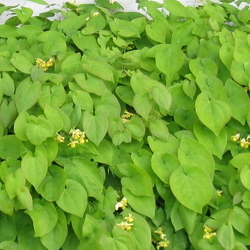 This is another plant that is easily divided in early spring to make more plants. I love to use it around red roses. Polemonium caeruleum (Jacob’s ladder), a beautiful blue that blooms repeatedly if cut back. 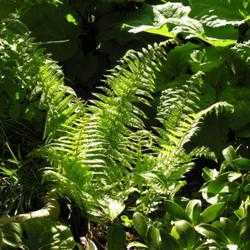 I have it in both sun and shade, and it has the advantage of having foliage that look like a fern when out of bloom. It also comes in white. It looks beautiful in the presence of white lilies like Lilium regale or 'Casa Blanca'. Other suggestions for sun to shade plants are Epimedium sulphurum x versacolor (which requires moisture in sun, but no additional moisture in shade) and hardy geraniums, especially the stronger ones like 'Bevan’s Variety', which was highly recommended by the Chicago Botanic garden, can be used as a specimen plant or an edger in anything from full sun to almost complete shade. It is also very easy to divide and move around your yard. Have a look around your neighborhood. Call your Master Gardener. There are many ways to make your garden beautiful as it matures.